A nice little video from AbeBooks is brought to us by Galley Cat. This has a slightly different focus from the post I did in October, which was about the smell of a new book. 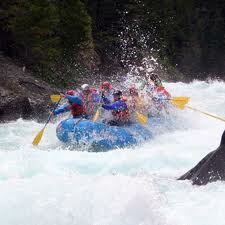 We can feel the boat speeding up. The water is rushing whiter, and flowing faster. The banks are closing in and becoming steeper and steeper. It’s exhilarating, almost too exciting — but just around the next bend will be the good old placid river we all love to float down. Maybe. We have come though a few weeks of changes. 1. The Economist’s April 14th issue includes two articles about our business, one on e-book publishing and the other a leader about the high cost of academic journals. They suggest that the publishers are involved in selling back to the taxpayer the results of research we’ve already paid for. Not a good issue to be raising just now! 2. The DoJ suit against Apple and the two unrepentant agency pricing publishers continues. 3. The PEW Research Centre’s Internet and American Life Project on e-books is getting wide coverage, suggesting deep changes in the activities of readers. 4. NPR’s On the Media broadcast this week was about our industry and the problems facing it. 5. Amazon is starting to eat more and more of our lunch. They just became the publishers of the James Bond books. 6. The pressure from Amazon only gets more intense: the more they sell of our books the bigger the discount they will want. Non-compliance may result in the disabling of the buy button for a publisher’s books. 7. The Google settlement — whatever is happening there? I promise to try to do no more posts on the future of publishing. I want to stop beating this particular horse. In return, please, please, all think about what steps you can take to prepare for the inevitable and huge changes that are coming to a desk near yours. Strictly speaking a font (fount in UK) is a number of alphabets (plus a few additional characters) in one size and one type design. Just as many of the terms in our industry date from the days of hot-metal type, the word font/fount derives from the same root as foundry (French fondre) and reminds us of the pouring of molten type metal into the matrices from which the individual letter would be cast. The font would be the result of this process. We tend to use the word font now to mean typeface — as in say Baskerville — whereas the strict definition would mean merely Baskerville Roman, Italic, Bold, Bold Italic and Small Caps in say 10 point. If the job needed 12 point too that would call for another font of the same five alphabets. There’s no fighting this shift in meaning though — the power of Apple’s drop down menu means that font means typeface now. We know that readers are reading more ebooks in the US, but now new research gives us some interesting insights into their behaviour and their use of digital and physical content. Some 30% of those that read econtent claim that that they now read longer, with some 41% of tablet readers and 35% of ereaders readers claiming to be reading more. The research claims one-fifth of American adults (21%) have read an e-book in the past year, which is an increase of some 4% on those who, in December, claimed to have read an e-book in the previous year. This is probably understandable given the amount of devices that were received as presents over the Holiday and Christmas period. Is it surprising that those who read ebooks, read more books than those who don’t have devices? One would assume that those who have bought the devices would have done so to read and therefore would be readers, and gifts would be probably given to people who are known readers, so it’s not surprising that they have used the devices and even have read more as they go through their early adoption phase. The figures make one assume the survey demographic chosen are heavy readers, but the figures given are that the survey included readers who had read; only 1 book (8%), 2-3 books(17%), 4-5 books(16%), 6-10books (19%), 11-20 books(18%) and over 20 books (22%). The first interesting point is that that those of who read an e-book in the past 12 months, some 42%, did so on a computer. This compared to those who used an ebook reader (43%), a smartphone (29%) and a tablet (23%). This issue is however is whether the high level of computer reading is down to transition and adoption of new devices and if it was consistent over the full year. The next interesting point claimed by the research was that some 88% of those who read an e-book also read a printed book. Of those surveyed, 14% claim to have read both printed books and e-books. Overall, over the year, 72% of adults surveyed read a print book, 21% read an e-book, and 11% listened to an audiobook. The research also looked at the reading behaviour and why readers read ebooks. Again we could suggest that 2011 was a transient year in the US and although the research claims book readers are more likely buy their most recent books (48%), rather than borrowed them (24%), or loan them from a library (14%), we have yet to see the real loan, rental and alternatives such as ‘on demand models’ in the market. DRM still remains a borrowers and consumer nightmare and today will constrain borrowing. However, it was interesting that those how read both physical and digital books preferred e-books when they sought convenience to buy quickly, when travelling or commuting and when they wanted to review a wide range of titles. 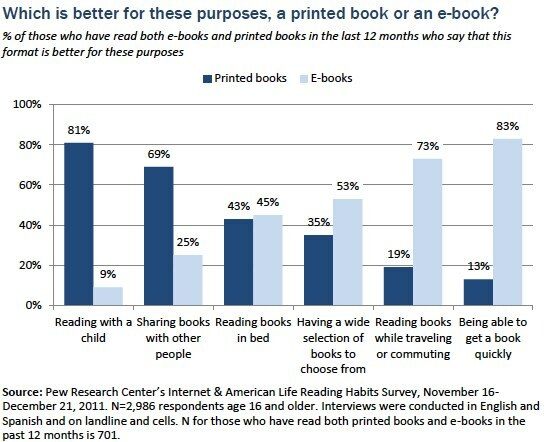 As for that favourite reading place the result was split with 45% prefer reading e-books in bed, while 43% prefer print. Book recommendations clearly should be a wake-up call for all those that believe that we are still in a mass market community. The vast majority, some 81% of ereader and tablet owners, get recommendations from ‘friends and family’. This also applies to non ereaders surveyed (64%) too. On line bookstores and web sites were high influencers with 56% and 28% respectively but physical bookstores and libraries had far less influence (31% vs 23%) and 21% vs 19%) respectively. Social networking and usage of friends and family is an obvious pivotal key for all. The main reasons given by those who do not own ereaders and tablet devices are; they don’t need or want one, they can’t afford one, they have enough digital devices already, or they prefer printed books. Not exactly rocket science but confirms what we probably already knew. The survey found that 19% owned a reader and same number owned a tablet but it didn’t identify how many owned both. Of the tablets 61% were iPad and 14% Kindle Fire 14% with the Nook only registering 1%. Of the reader devices Kindle were 62%, Nook 22% and Kobo and Sony only 1% and 2% respectively. Of the adults who did not own a tablet 10% plan to buy one in the next six months and a further 8% eventually, whilst 8% who don’t have an ereader plan to purchase in next 6 months and 5% eventually. This would indicate that there is still significant device growth and that Amazon is very well positioned in both segments to achieve further growth in the US. What it clearly says also is that the device battles are clearly down to Apple versus Amazon today. How that may shift over time will be interesting to watch and also what happens with the great unread will be even more interesting to monitor. It was a pity that the question of DRM appears to have not been covered, along with the question of perceived ownership versus licence and the lack of ‘first sale doctrine’. These are perceived consumer issues and this would have been a great opportunity to gauge consumer perception. Finally, the survey also claims that although econtent is relatively easy to find, 23% of those who read ebooks, digital newspapers, magazines, etc. can’t find what they are looking for or its not available in the format they require it. Although the detail is somewhat ambiguous the message should be noted. The research may not be news to many but what is important is that we monitor these social changes in reading habits and understand the market trends. The research was prepared by Princeton Survey Research Associates International for the PEW Research Centre’s Internet and American Life Project and the Gates Foundation. The project was underwritten by the Bill & Melinda Gates Foundation. Here’s a chart taken from that same research, brought to us by Business Insider also on 5 April as their Silicon Alley Insider Chart of the Day. They entitle the chart “The Death of Printed Books” which hints at what they make of the information in it! Of course one survey is just one survey and results can change over time. But do we really think things are ever going to swing back to favor the printed book over the ebook? Ebooks are real, and no amount of head-in-sand-burying is going to make them go away. The reading experience today is not anything like what it will become in a few years. The improvements will make the ereading experience overwhelmingly superior to turning pages in a printed book. I fear that however much some of us may love a well-printed book, the fact that ebooks are and will always be cheaper to produce means that the print book will eventually be squeezed out. I bet there were lots of people in the 15th century saying that these new-fangled print books would never take the place of a beautifully hand-written volume, but of course the scribes rapidly lost out to the more efficient print medium. Yes, you can still get a book copied by hand, but it will cost you so much that few people can afford to pursue that hobby. Cheapness and convenience will always win out. The most thoughtful piece I’ve found yet about the difference between the experience of reading an ebook and a printed book is from The Technium. It’s well worth reading. 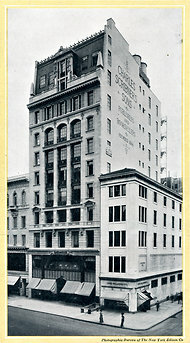 If you stand on the west side of Fifth Avenue at 48th Street and look up, you can still see the writing on the side of the old Scribner Building. You had to be here prior to 1989 to experience it as a book shop. The New York Times, courtesy of the Grolier Club, gives us a nice photo gallery of what it was like buying your books in such elegant surroundings. The legendary Max Perkins worked for Charles Scribner’s Sons and whipped such people as F. Scott Fitzgerald, Ernest Hemingway and Thomas Wolfe into shape. I once worked with someone who had Mr Scribner’s old table in her office — it was almost like a shrine in the corner there. Scribner’s book publishing business is now part of Simon and Schuster. When you think about it the speed at which printing presses run makes it miraculous that a dot can be placed with such accuracy. Four color printing requires millions of dots to be placed in an accurate rosette pattern, one blue (cyan) one magenta (red) one yellow and one black (CMYK), carrying information about the color of that tiny piece of the picture being reproduced. Get out your magnifying glass (loupe, in the business) and admire. The accurate positioning of one color to the others is called register. As the accompanying post from Dead Tree Edition says, 1/300th of an inch is enough to make a job “out of register”. Tyro book designers should beware: setting small type in more than one color is a quick and dirty way to show the limitations of offset press equipment. Being off register in a picture is not ideal, but you will still be able to make out the subject of the picture — almost any newspaper will illustrate this, though they use a fairly course screen. With type the confusion made by the slightest variation in dot position will quickly make 10 point type unreadable. Type should always be printed in one color, unless it’s large display type. It’s also a bad idea to drop small type, especially if it has fine lines or serifs, out of a solid background. To drop it out of a four-color tint is suicidal (well, more accurately, murderous). These three are on a sort of rising scale. Copyright is almost unavoidable, the other two require larger efforts, ending up with lots of lawyers, and hence significant cost. In the book business we mostly deal with the first only, though I do have a friend who patented a method of binding a book in a molded plastic cover, and of course we all dream of “creating” a property that requires trademarking. This post from Fresh Asylum sets out the differences quite succinctly. People tend to assume that the copyright date in a book is the same as the date of first publication. This is only approximately true. If a book is published in say 2005 as a hardback, then published two years later in paperback, the copyright date for the paperback is still 2005. So the paperback will say © 2005 even though the first time this ISBN appeared in print was 2007. The wish of young editorial assistants to change the copyright date to 2007 should be resisted. The copyright date is an unalterable fact: the book was copyrighted in this or that year. Just because it is now published in a different form, even by a different publisher, this date does not change. The Library of Congress has it recorded as 2005, and nothing a publisher may get up to can change that. When publishers take over other companies, the copyright date of the books acquired cannot change, nor can the name of the copyright owner — unless that is the content changes (significantly), in other words unless a new edition is published in which case a new copyright registration will (probably) take place. An additional complication is introduced by the habit of using the copyright date almost as a marketing tool. If your book says copyright 2013 even if it’s published today, it will always look slightly more up-to-date that if it told the literal truth. Educational publishers now tend to put a large proportion of their copyright dates one year ahead. There’s no doubt a rationale used to justify this, probably having to do with the academic year for which the book is first available. The copyright law allows for the copyright date to be off by one year — no doubt with the expectation that the “error” would usually tend to be in the opposite direction because of books delayed during production. The AIGA 50 Books/50 Covers show is going on now. They have a blackboard at the display (164 Fifth Avenue, NYC) which shows a definition of “book”. Visitors to the show are invited to pick up a piece of chalk and add their own definition. The definition printed at the top of the board includes a derivation from the German for beech tree: die Buche (beech) to das Buch (book). In German trees tend to be feminine, and the ability to use the same word with a gender change to designate something else may be a useful feature for a language (cf French le tour, as in Tour de France and la tour as in Tower of London). But why books would sprout from the beech rather than some other tree is for me the real question. After an extensive discussion of the word’s varying gender in different Germanic languages, the OED etymology for “book” tells us “Generally thought to be etymologically connected with the name of the beech-tree, Old English bóc, béce, Old Norse bók < (see beech n.), the suggestion being that inscriptions were first made on beechen tablets, or cut in the bark of beechtrees; but there are great difficulties in reconciling the early forms of the two words, seeing that bôk-s ‘writing tablet’ is the most primitive of all.” So they trace the connection back before the book as we know it (what today is beginning to be called the p-book — will that really stick?) was invented. I had been speculating that it might have been because the boards in which early books were bound were (often?/ always?/sometimes?) wood, and that maybe beech wood was favored over others — for which of course I have no evidence, but given the earlier existence of a beechen writing tablet, the need to look into this speculation evaporates. What would a writing tablet be? Something like a clip board, or as the OED entry suggests a board into which you’d carve a message? (The Romans had them as wax sheets contained in wooden covers.) I guess one can see the process by which the word for writing tablet would come to cover the thing we know as a book, just as slate might easily become the word for iPad.